This conference is inspired by all the amazing people out there providing great care and looking for better tools to help them. 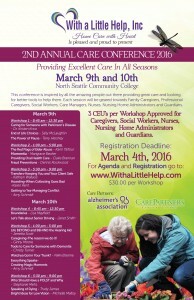 Each session will be geared towards Family Caregivers, Professional Caregivers, Social Workers, Care Managers, Nurses, Nursing Home Administrators and Guardians. Nursing Home Administrators and Guardians.